From “Islands of the Various Provinces”. Hiroshige designed over 300 prints for round fans (uchiwa-e), but very few of them have been preserved, since they were usually glued to bamboo frames and actually used. Most of the fan pictures that have been preserved are from sample books compiled for fan sellers, which were purchased by Western collectors around 1900. Others – like this print – were collected in albums. The man-made island of Tsukudajima served as a place to anchor barges and fishing boats. Tsukudajima was an island in Edo Bay where cargo ships frequently moored, as the three on the left of this picture have gone. Two pleasure boats, one with a group of fishermen appear in the centre of the picture, the stone walls of the island appearing to the left. Uchida mentions this series, but does not list the titles of any prints. 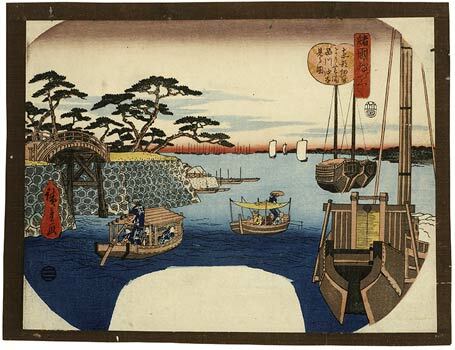 Stewart does not even mention the series, and it is possible that this print, like so many of Hiroshige’s fan prints is unique. The print is relatively early among Hiroshige’s fan prints, and is not printed with the same technical effect of the two others in the collections. Reproduced in: Ingelheim catalogue, no. 138.